The Shams Ensemble is a musical group that performs traditional Kurdish, Sufi, and classical Iranian music with the tanbour (the Kurdish lute), daf (frame drum), and percussion instruments. It was founded by composer Kaykhosro Pournazeri. Pournazeri has formed the Shams Ensemble with the vision of bringing back the lost art of the tanbour through compositions that fused the tanbour with other classical instruments. He invited some of his students who were familiar with playing the tanbour, and gradually, they became well-known in Iran. 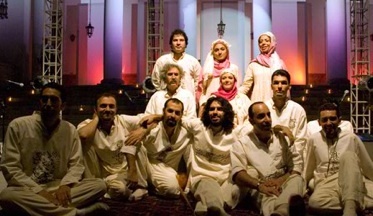 Initially, the group performed under the name of Tanbour-e-Shams, but adding traditional and Kurdish music to their performances, they took the name of the Shams Ensemble. Over the years, there have been more than fifty players and singers, the majority of whom were Pournazeri's students. After the 1979 Islamic Revolution in Iran, women were banned from performing solo in front of men -- that includes singing or playing any instruments. Only recently, women have been included as vocalists and players of the tanbour. Currently, the Shams Ensemble has 15 players.